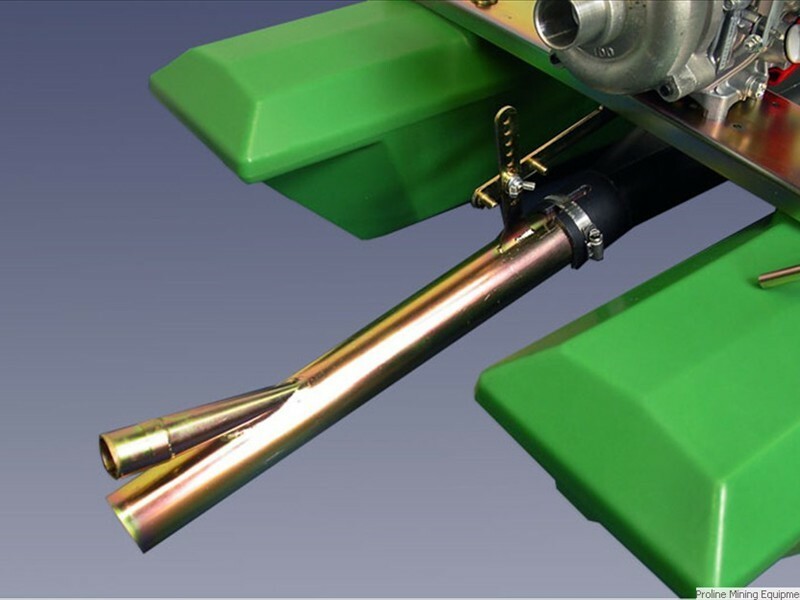 The Proline 2" dredge has seen many improvements, resulting in a smaller and more portable unit, with increased power and features normally found only on larger dredges. It is powered by our Honda GXH50/HP100 pump package, which produces well over 100 gallons per minute, with twice the pressure of our previous pumps. The Honda engine is very quiet, offering nearly twice the fuel economy of the 2-cycle engines, and it eliminates the need to mix gas and oil. Our HP100 pump is manufactured with the same quality and features found on our larger pumps, such as the "flusher port," which supplies water pressure to run a flusher nozzle for cleaning crevices. The Proline was the first 2" dredge with this feature. Due to recent changes in the pump and jetting system on this dredge, the suction power has dramatically increased. This increase in power led to a new classifier with a riffle system that produces a more effective low pressure vortex behind the riffles themselves, improving fine gold recovery. 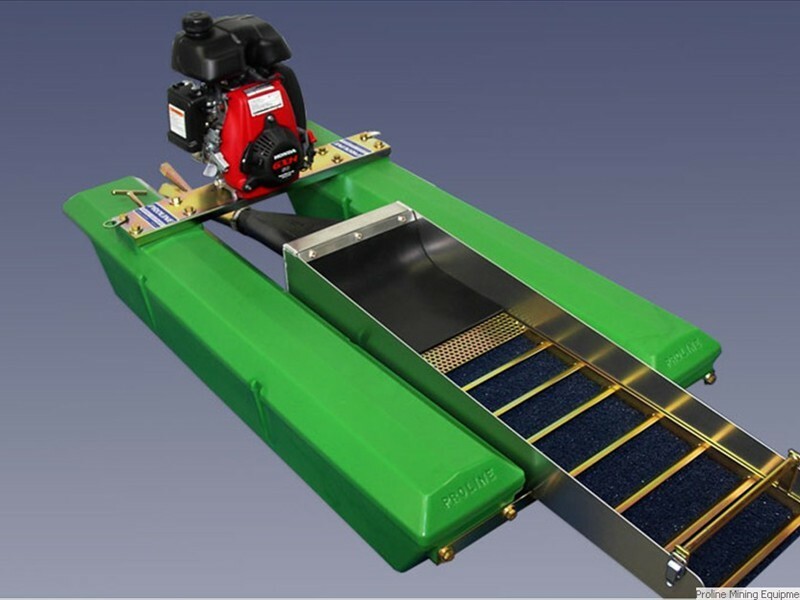 Our unique one-piece classifier/riffle system simply unlatches and lifts out of the sluice box, which makes for fast and easy cleanups. We still use "Nomad" matting for the entire length of the sluice box. The pontoons are actually used as part of the frame, eliminating the need for a heavier conventional frame. A rod is supplied for clearing rock jams that occur at the power jet, and actually stays on the dredge when not in use. Through these improvements we were able to shed a few pounds, while making the dredge stronger. We suggest that you compare our features and quality with every other small dredge on the market. No other 2" dredge compares. PLEASE PLACE ORDER by using our PRICE LIST and ORDER FORM or CONTACT US directly. 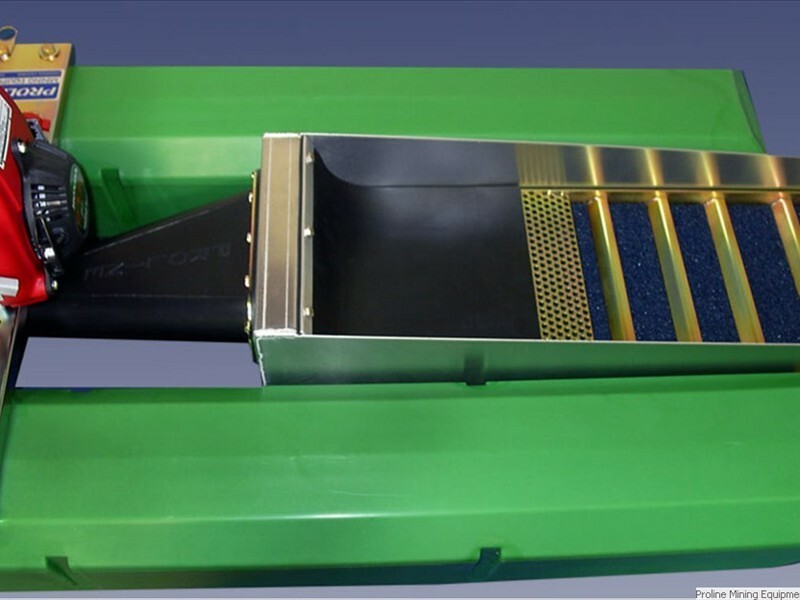 Sluice Box: 10" x 36"
Dredge Hose: 2" x 10 ft.
High Pressure Hose: 1.25" x 42"
Intake Hose: 1.5" x 24"
Flotation: 2 polyethylene floats 9" x 25.5" x 48"